This post is from a former manager and colleague of mine; currently a fellow Rotarian and someone I like to think of as a friend. Don was one of the more thoughtful and kind people I ever had the pleasure to work for and with (and he always made sure it was far more “with” than “for”). 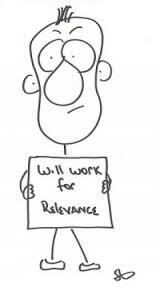 These are some of his thoughts on relevance; a concept the organization we both retired from – and we both have returned to in one capacity or another – seems to be struggling with nowadays. I’ve spent a lot of time recently, thinking about our psychological need for relevance, and the huge impact it has on the way we live our lives. I’m speaking here about personal relevance, which I will define as the degree to which we feel connected to others in a meaningful and valued way. This entry was posted on Thursday, July 9th, 2015 at 5:42 pm	and posted in Professional. You can follow any responses to this entry through the RSS 2.0 feed.